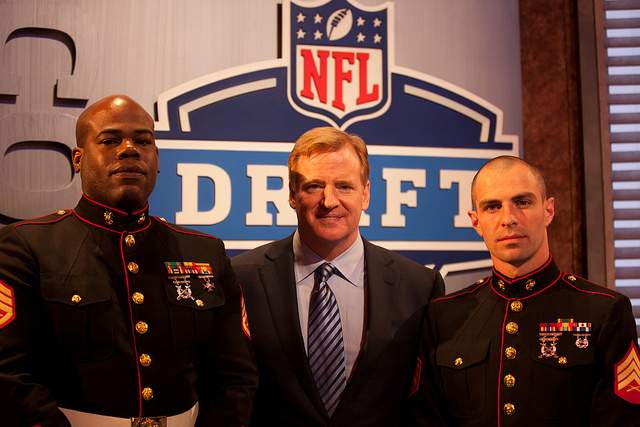 The NFL draft is just over a month away, and things are starting to take a little more shape than they were yesterday (and the day before that and the day before that). While we’ve known the draft order, it’s only with the conclusion of the combine and the advent of free agency that each team’s wants and needs really crystallize. As the clock ticks down to the first pick, which is slated for the Houston Texans, news is beginning to leak out from the various front offices and “multiple sources” are being cited in vague reports about what could or could not happen. And it’s great. Idle thought experiments are what make the world of sports go round — imagine if the Redskins hadn’t traded a King’s Ransom (three first round picks and one second rounder for the second overall pick a.k.a. 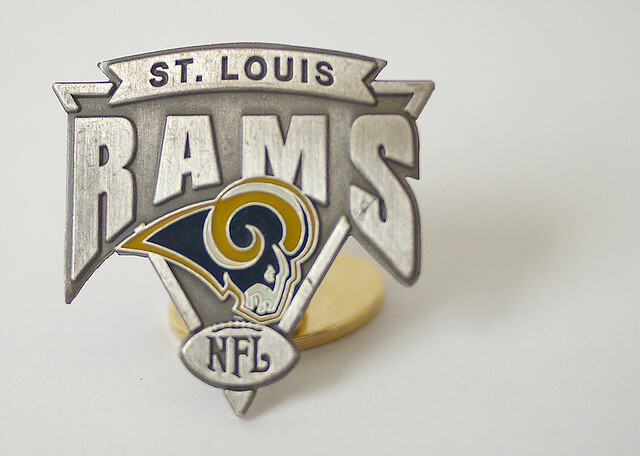 RGIII) to the St. Louis Rams two years ago? St. Louis would’ve snagged the franchise QB it so desperately craved, and still craves, but they were able to turn the picks from the trade “into seven players, including three defensive starters,” according to ESPN’s breakdown of the trade, and they’re still primed to pick second this year after the Redskins collapsed. And, guess what? There’s a few great QBs for the Rams to choose from in this draft too. There’s also Jadeveon Clowney, who is about as elite of a prospect as you could ask for. Back to him in a second. The important thing is the draft is almost here, and we’re starting to hear some fun and exciting things about some of the big name prospects and the fate of the high draft picks. Read on to find out. So now everyone’s primed to take a dive into the minds of the St. Louis front office. They need a quarterback. Badly. All respect to Sam Bradford, but there was a reason why everyone spent a year thinking that St. Louis had blown the trade with Washington. To make matters worse, this draft has a bunch of interesting quarterbacks. While the conventional wisdom says that the Rams need an offensive lineman and a QB more than a pass rusher, Clowney’s sheer talent makes skipping him a hard sell. Teddy Bridgewater and/or Johnny Manziel are poised for a slide. Courtesy of WalterFootball.com‘s Charlie Campbell, it looks as though at least one of the two of the top Quarterback prospects are going to be in for a rude awakening on draft day. 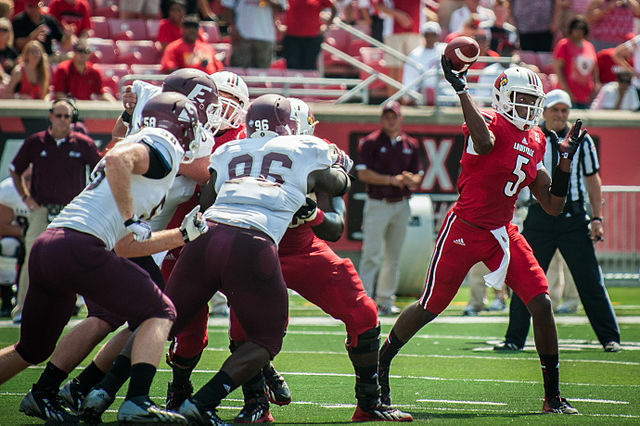 “Teams are lukewarm on Bridgewater, as they have concerns about his physical skill set and build. A few sources said they wouldn’t be surprised if Bridgewater fell to the second round,” wrote Campbell, adding that, “We’ve also learned that one team picking in the top 10 has Alabama quarterback A.J. McCarron rated ahead of Bridgewater.” Zing. 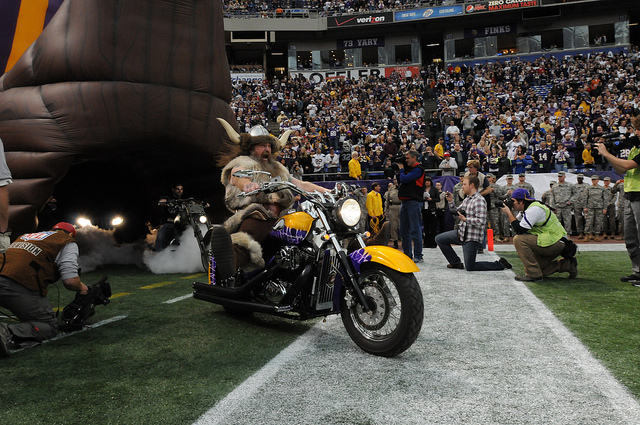 The Minnesota Vikings, like many other NFL teams, need a quarterback. Badly. No disrespect to Christian Ponder, but they’re definitely looking for an upgrade to put under center. With the eighth overall pick, it’s been widely assumed that they would look into grabbing one of the top tier throwers with that — maybe a Bridgewater, a Manziel, or a Bortles. Maybe not, says DraftInsider’s Tony Pauline, who suggests that the team might hold off for LSU’s Zach Mettenberger in the second round in order to grab a defensive linebacker in the first. Pauline thinks they’re targeting Khalil Mack, fresh from Buffalo, with their first round pick. That’s not an inherently bad thing — Mack’s a solid prospect, and Minnesota’s hurting at the LB position, but after watching the Vikings design an offense by handing the ball to Adrian Peterson and say “here, make something happen,” for the last seven years, one would think they might want to get a real, honest-to-goodness quarterback. Or not. But, hey, at least Jaws really likes Mettenberger, so that’s something. 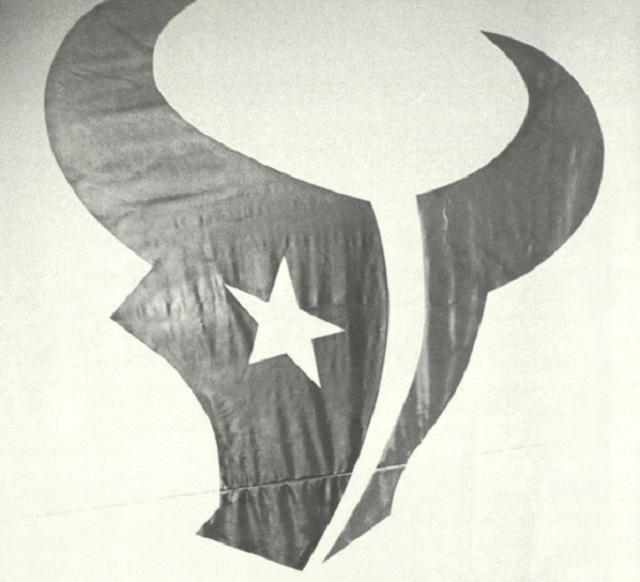 The Houston Texans were not supposed to have the No. 1 pick this year. After coming off a successful playoff run in 2012 that saw them amass a 12-4 record with one of the league’s most intimidating defenses and a solid offense with some great pieces (Arian Foster, Ben Tate, and Andre Johnson foremost in that crew), the team promptly fell apart in 2013, going a Jaguars-ian 2-14, including losing every game after week two. It’s the dark side of a league where parity is paramount. After parting ways with Matt Schuab in the off-season, after Schuab’s game promptly fell off the face of the earth, the Texans find themselves in desperate need of a quarterback. How desperate? They signed FitzMagic, Harvard alum Ryan Fitzpatrick, to a two-year deal — the same Fitzpatrick who couldn’t stay in Buffalo or Tennessee — not exactly the most competitive franchises in the league. The Texans are desperate, and they’ve already gone on the record saying that they’re going to grab as many as two quarterbacks in the draft. Just maybe not with the first overall pick. Because, you know, Clowney. “If we decide to draft this guy, we’re not just going to play him at one position,” head coach Bill O’Brien told fans and suite holders. “We may start him off at one position but use him in a lot of different ways. He’s a unique talent but again, that’s if we draft him.” This ‘if’ seems to be a matter of internal debate, as word out of Houston seems to suggest that they’re trying to trade down. 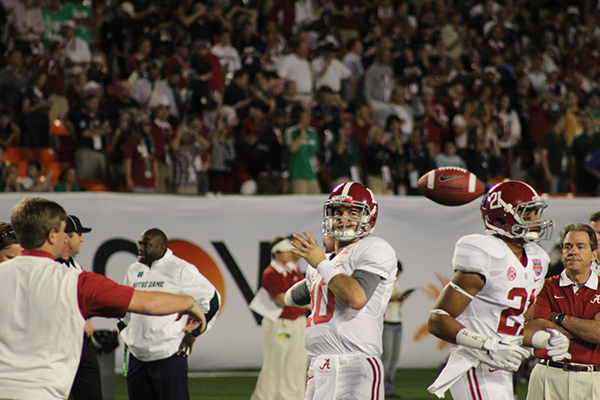 AJ McCarron, Future Arizona Cardinal? The Arizona Cardinals, who are picking twentieth this year, reportedly love AJ McCarron, the game manager for the Alabama Crimson Tide. Per NFL.com’s Daniel Jeremiah, the best bet seems to be in the second round — where the Cards will have the fifty-second pick. McCarron, arguably most famous on a national level for his now-fiancee Katherine Webb, who was creepily objectified by Brent Musburger during the 2013 BSC Championship Game, would be playing behind nominal starter Carson Palmer, who is 35 and nearing retirement.